Ryanair, Europe’s No.1 airline, today (30 Nov) revealed Irish customers are the least organised gift givers in Europe with over 25% waiting until Christmas Eve to purchase Ryanair vouchers. UK customers are the most generous in Europe, spending on average 15% more on Ryanair vouchers that the rest of the continent. Ryanair also revealed record Christmas gift voucher sales last year as more customers skipped the shops in favour of the gift of travel. 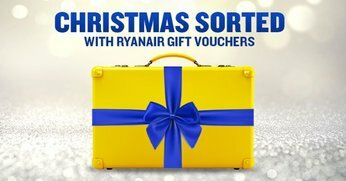 Ryanair’s festive flight vouchers are now on sale on the Ryanair.com website, allowing customers to give their loved ones the gift of travel and the choice over of over 200 Ryanair destinations. Vouchers, starting at €25/£25, can be personalised with a greeting of your choice, and are also the perfect choice for corporates looking for a tax-free way treat their employees this Christmas. “Last year our vouchers were a Christmas cracker with customers and we expect they’ll be an even bigger hit this year given our route network has expanded and our fares keeping getting lower. Customers can now fit an unforgettable trip to one of Ryanair’s 200 destinations across Europe and North Africa into any Christmas stocking.